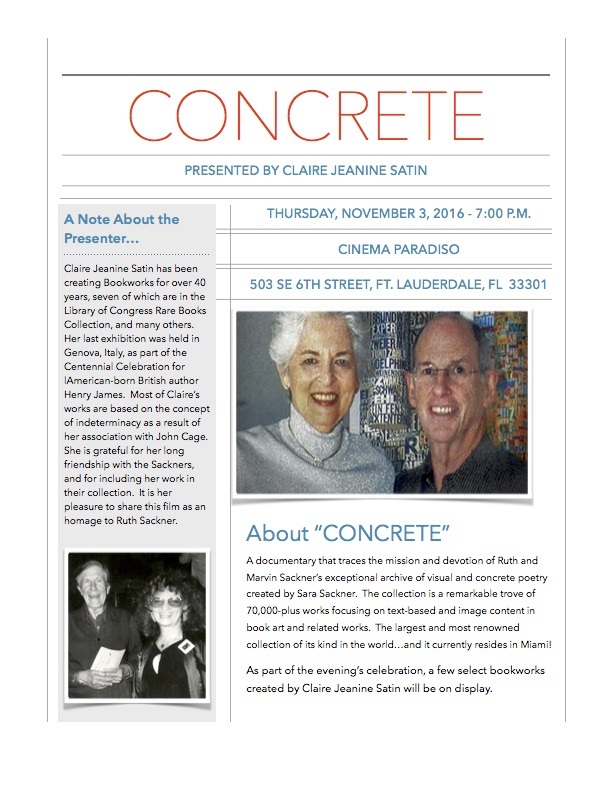 The film will be shown on Thursday, November 3, 2016, at 7:00 P.M. at the Cinema Paradiso, 503 SE 6th Street in Ft. Lauderdale, FL 33301. Satin’s documentary traces the mission and devotion of Ruth and Marvin Sackner’s exceptional archive of visual and concrete poetry created by Sara Sackner. The collection is a remarkable trove of 70,000 plus works focusing on text-based and image content in book art and related works. The largest and most renowned collection of its kind in the world currently resides in Miami. “It is my pleasure to share this film as an homage to Ruth Sackner,” says Satin. “I am grateful for my long friendship with the Sackners and for including my work in their collection.” Satin has been creating Bookworks for over 40 years. Seven of her Bookworks are in the Library of Congress Rare Books Collection as well as many others. Her last exhibition was held in Geneva, Italy as part of the Centennial Celebration for American-born British author, Henry James. Most of Satin’s works are based on the concept of indeterminacy as a result of her association with John Cage.